A geodesic sphere is an arrangement of polygons that approximates a true sphere. A geodesic dome is a portion of a geodesic sphere. Buildings or roofs have been constructed out of geodesic domes that range from 5-100% of a sphere. Domes used for houses are usually arrays of triangles that form three-or five-eighths of a geodesic sphere. Geodesic domes are efficient structures in several ways. The triangle is a very stable shape; for example, a force applied to the corner of a rectangle can deform it into a parallelogram, but the same force will not deform a triangle. This makes geodesic dome buildings highly resistant to such forces as snow coverings, earthquakes, wind, and even tornadoes. The surface area of a geodesic dome is only 38% of the surface area of a box-shaped building enclosing the same floor space. There is less surface exposed to outdoor temperature fluctuations, making the building cheaper to heat and cool than a rectilinear structure. Geodesic domes can be constructed quickly without heavy equipment. Using prefabricated components, it takes just a few people to erect the dome for a 2,000-sq ft (185-sq m) home in 10 hours or less. A geometric dome supports itself without needing internal columns or interior load-bearing walls. This property makes such structures appealing for use as churches, sports arenas, and exhibition halls. The aesthetic appeal of lofty ceilings makes them attractive as homes, and full or partial second-story floors are easily suspended halfway up the enclosure without any support other than attachment to the dome itself. In 1919, seeking a way to build a larger planetarium, German engineer Walter Bauersfeld decided to mount movable projectors within a stationary dome. Until that time, planetarium domes rotated while external light entered through holes on the dome shell to simulate stars and planets. This limited the practical size of the dome and the number of people it could hold. Bauersfeld's concept of interior projection would work in a much larger dome. The first model constructed was more than half of a sphere; 52 ft (16 m) in diameter. Bauersfeld solved the problem of how to construct such a large sphere by approximating it with an icosahedron (20-sided solid with equal triangular faces) and subdividing each face into smaller triangles. He framed the triangles from nearly 3,500 thin iron rods. To construct a spherical shell over this framework, he erected a sphefical wooden form inside the frame and sprayed on a pasty concrete mixture. The shell was designed to be the same proportional thickness as that of an eggshell compared to its diameter, a ratio later considered appropriate for geodesic domes. Thirty years later, R. Buckminster Fuller, an American architect, engineer, poet, and philosopher, independently invented a similar structural system. Following World War II, Fuller wanted to design affordable, efficient housing that could be built quickly from mass-produced components. Willing to look outside of conventional approaches, Fuller began to work with spherical shapes because they enclose a given space with a minimum of surface area. He first framed spheres with a network of strips approximating great circles (circles on a sphere with centers that coincide with the sphere's center); the strips formed triangles as they crossed one another. He called the product a geodesic dome because great circles are known as geodesics (from a Greek word meaning earth dividing). Eventually, Fuller began forming spheres from hexagons and pentagons (like the panels on a soccer ball) and dividing them into triangles for strength and ease of construction. In 1953, Fuller used his new system to cover the 93-ft (28-m) diameter courtyard surrounded by Ford Motor Company's headquarters building. The building was not designed to support the great weight of a traditional dome, but Fuller's creation weighed 95% less. He completed the design and construction in only three months. A temporary mast erected in the center of the courtyard supported the dome during construction, and the structure was incrementally raised and rotated following completion of each new section. The frame consisted of 12,000 aluminum struts weighing a total of 3,750 lb (1,700 kg) that were connected to form triangles and then lifted into position and riveted to the growing frame. When the dome was completed, it was gently lowered onto mounts that had been installed on the existing building. A clear fiberglass panel was installed in each triangle to complete the dome. In 1954, Fuller received a patent on geodesic domes. During the 1960s and 1970s, an era in which unconventionality was prized, geometric domes became popular as an inexpensive way for environmentally conscious people to build their own homes. Instructions were widely available, but the quality of materials (including such strange choices as paper mache and discarded tin cans) and the skill of do-it-yourself builders were inconsistent. Amateur-built domes tended to leak when it rained, insufficient use of insulation limited their energy efficiency, and inadequate numbers of skylights left interiors dreary. Fuller predicted that a million geodesic domes would be built by the mid-1980s, but by the early 1990s, estimates placed the worldwide number somewhere between 50,000 and 300,000. A small but persistent contingent of unconventional homebuilders continue to build geodesic dome homes, primarily from kits. However, Newsday reported in 1992 that the majority of geodesic dome structures have been built for green-houses, storage sheds, defense shelters, and tourist attractions. One of the most recognizable of these is the 165-ft (48-m) diameter sphere at Walt Disney World's Epcot Center. Built of composite panels of ethylene plastic and aluminum in 1982, the structure houses a ride called Spaceship Earth, a termed coined by Fuller himself. Geodesic domes range in size from the 460-ft (143-m) Poliedro de Caracas sports arena in Venezuela to temporary shelters that are 15 ft (5 m) or less in diameter. Consequently, construction materials vary widely. Simple, movable structures may be built of polyvinyl chloride (PVC) pipe or galvanized steel conduit frames covered with plastic sheeting or parachute canopies. Large, permanent structures like arenas and factories have been built from materials like aluminum and steel frame struts covered with aluminum, copper, structural gypsum, acrylic, or Plexiglas panels. Most residential dome kit manufacturers use wood components, primarily kiln-dried Douglas fir struts covered with 0.5-in (1.3-cm) exterior-or structural-grade plywood. Such kits include various designs of connectors to securely fasten the wood struts together in the proper configuration; high-strength aluminum, or steel coated with zinc, epoxy, or industrial primer are commonly used for connectors. Zinc-plated steel bolts secure the connectors and paneling is nailed on. A few kit manufacturers use altemative materials to make prefabricated panels that combine the frame and exterior covering. One, for example, makes molded fiberglass panels. Another supplies reinforced concrete panels; steel mesh extending from the panel edges is overlapped with mesh from the adjoining panel, and the joint is sealed with concrete. consists of fiberglass batting or sprayed-on urethane, cellulose, or Icynene plastic foam. Although dome homes are built from manufactured kits, designs are flexible. As many as half of the triangles in the dome's lowest row can be removed without weakening the structure, so door and window openings can be plentiful. Vertical-walled extensions can be built out from such openings to increase the floor space. The dome can sit directly on ground-level footings (short walls recessed into the ground to bear the building's weight), or it can be erected atop a riser wall up to 8 ft (2.5 m) tall. Space must be provided between the interior and exterior walls to accommodate insulation. Some manufacturers create this space by making the struts from wood that is 4-8 in (10-20 cm) thick. Others make this space 14.5-21 in (37-53 cm) thick by using compound struts consisting of two strips of lumber joined with plywood gussets. The following is a composite of techniques used by several individuals using kits from various manufacturers. 1 After clearing and leveling the home site, a trench is dug for the foundation footing, following detailed drawings supplied by the kit manufacturer. The base of the dome is not circular; rather, it is outlined by five short walls alternating with five long walls (twice the length of the short walls). Forms are placed for the footings; many builders like to use permanent Styrofoam forms that need not be removed. Concrete is then poured in the footing forms. 2 A layer of sand may be used to further level the surface and provide a base for the foundation slab. Reinforcing steel bars are tied together in a grid, and concrete is poured to form the foundation. 3 Foundation walls are built atop the footings, up to approximately ground level. If desired, riser walls (which are provided as part of the kit) are installed atop the foundation walls and bolted to one another. 4 Floor joists are installed by standing wooden 2x12 (1.5x1.5 in [3.8x29.2]) boards 16 in (40 cm) apart above the foundation. The joists are nailed to a perimeter wooden frame and a wooden crossbeam. Three-quarter-inch (1.9-cm) thick plywood sheets are laid across the joists and nailed in place. The superstructure typically consists of 60 triangular panels. Depending on the desired size of the dome, the panels are usually 6-10 ft (1.8-3 m) on a side. They may be prefabricated with the exterior panels installed, or they may constructed on site from precut lumber and metal connectors. 5 Base plates are installed atop the foundation or riser walls. These precisely beveled 4x6-in (lOx15-cm) wood strips provide a transition between the horizontal top edge of the walls and the slightly tilted triangles of the dome's bottom strip of panels. 6 Matching the color coding on the kit's wooden struts and metal connectors, a triangle is formed and secured with bolts. The triangle is lifted into position and bolted to the wall and/or to the adjacent triangles. Successive rows of triangular elements are placed until the dome is completely formed. Because of their light weight, the triangles do not need supplementary bracing to hold them in place during construction. 7 Wooden studs are nailed inside each triangle. Running perpendicular to one side of the triangle, they are placed about 16 in (40 cm) apart. If an odd number of studs is used, the center one is secured against a per-pendicular block near the triangle's vertex, rather than extending to the vertex. 8 Matching color-coded edges, the plywood panels are lifted into position on the exterior of each triangle and nailed into place. By working downward from the top of the dome, the worker can stand on the open framework below while attaching each panel. 9 Vertical walls and roofs are framed for any desired extensions that will project outward from the dome. Plywood panels are nailed to the exterior faces of the extensions. Dormer extensions can also be erected for second-story windows. 10 Windows, skylights, and exterior doors are installed. 11 The roof is covered with rubber sheeting, and conventional roofing material (such as shingles or tiles) is applied. 12 Conventional siding material (such as stucco or vinyl siding) is applied to the exterior of the riser walls. 13 Insulation is placed between the struts and studs inside the dome and extension walls. 14 Walls are framed to divide the interior into rooms. Conventional drywall sheets are cut according to patterns included in the kit, and they are nailed to the interior walls and the inside surfaces of the dome and riser walls. Because of the many angles between triangular sections of the dome, amateur builders often hire a professional to tape the drywall joints. A quality geodesic dome structure is airtight and structurally sound. These are the factors that lower energy costs, the main consideration when building a geodesic home. Because the structure is basically airtight, condensation can sometimes be a problem. Normally it is controlled by the heating and cooling system but when the house has been closed up for a few days, moisture can build up. This is easily solved by turning the air system on or opening a door or window. 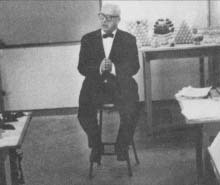 Richard Buckminster Fuller was born July 12, 1895, in Milton, Massachusetts. He entered Harvard University in 1913 but was expelled two years later. In 1917, he married Anne Hewlett and formed a construction company. In 1923, Fuller invented the stockade brick-laying method—bricks with vertical holes reinforced with concrete. In 1927 he designed a factory-assembled Dymaxion house, a self-contained unit suspended from a central mast with a complete recycling system. Dymaxion was a term he used for anything deriving maximum output from minimum input. Fuller also designed a Dymaxion car—an omnidirectional vehicle that gave minimum wind resistance—in 1928. This vehicle could seat 12, make 180° turns, run easily at 120 mph (193 kmph), and average 28 mi/gal (12 km/I) but was unprofitable because automobile manufacturers wouldn't mass produce it. Fuller's financial break came in 1940 with his Dymaxion Deployment Unit (DDUj, a circular self-cooled living unit with pie-shaped, corrugated steel rooms. The British used DDUs in World War II. In 1949, Fuller started work on geodesic domes. He applied for a patent in 1951 and received a contract in 1953 from Ford Motor Company to build a dome over their head-quarters' courtyard in Detroit. The U.S. Defense Department became Fuller's largest customer, using domes as temporary housing units and to protect radar equipment from harsh environments. At the time of his death in 1983, Fuller's domes were used worldwide. In 1985, fullerene was discovered. Fullerenes are carbon atoms arranged in sphere-like shapes with pentagonal and hexagonal faces, similar to geodesic domes. These "bucky balls" have up to 980 carbon atoms. Future refinements in geodesic dome construction may come from improved building materials. For example, in 1997 a concrete block manufacturer developed a hollow, beveled, triangular block with scored edges that could interlock with adjacent blocks. Properly shaped, such blocks could be used to construct domes. Another innovation involves designing domes based on a different mathematical premise. In a true geodesic dome, the edges of the triangular elements align to form great circles. Although not geodesic, a new design patented in 1989 uses hexagons and pentagons to form domes with an elliptical cross section. Because of its mathematical derivation, this design is called geotangent. Although geodesic domes maximize strength while minimizing construction materials, elliptical-profile domes offer two different advantages. They can cover a circular area without rising as high as a spherical dome. And they can cover elongated or irregularly shaped areas that vary in elevation. Located in northern Mexico, the world's largest industrial domes are a pair of manufacturing buildings covered with elliptical roofs 735 ft (224 m) long and 260 ft (80 m) wide. DiChristina, Mariette. "Elliptical Dome." Popular Science (January 1990): 74. Horton, Ted. "The Dome." Mother Earth News (June/July 1999): 64. Sieden, Lloyd Steven. "The Birth of the Geodesic Dome: How Bucky Did It." The Futurist (November/December 1989): 14+. http://www.Isi.usp.br/usp/rod/bucky/geodesic_domes.txt . (January 6, 2000). 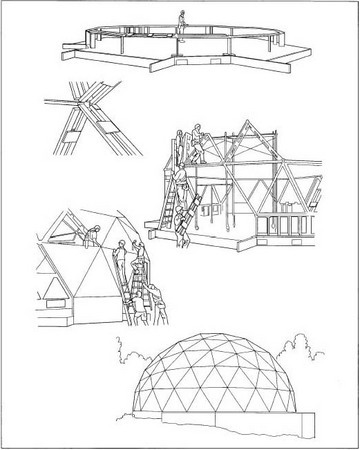 "An Introduction to Geodesic Domes." http://Owww.dnaco.net/-michael/domes/intro.html (December 2, 1999). "Design and Construction of Alpine Dome Homes." Alpine Domes. http://www.freeyellow.com/alpinedomes (January 6, 2000). "Home Sweet Dome." http://future.newsday.com (January 6, 2000). Timberline Geodesics. http://www.dome-home.com (April 4, 2000).